Evel Knievel for the Valley of Death. Congrats! Great work! Do you think it’s possible to offer this same kind of program to the Arts and Creative Content suppliers? Very positive beginning and early indicators of changing behavior are spectacular. Great job, Steve and team. 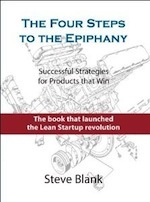 I’m a big fan of the Lean Launchpad approach. I’m not so big of a fan of the conclusion based on these snazzy charts. Great, they believe it. But does it lead to profitable businesses? The fact that the participants wound up with considerably more knowledge about the business model canvas that when they started is hardly surprising. It’s about as surprising as discovering that after a maths class, students seem to know more about basic arithmetic. It is borderline tautological. 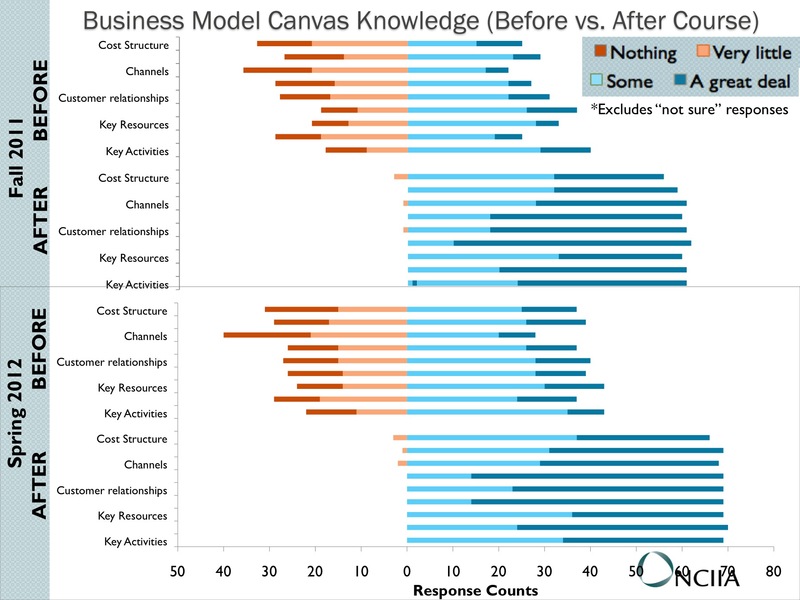 I believe this wholeheartedly…but not because of any of these charts, because I’ve seen it work in action. I agree, it’s a great start. I just hope there is more academic focus on hard data from successful companies and not “I believe” statements. Always looking for more people who want to volunteer a few months of their time helping teach. Then you could help us raise the academic standards. Your academic standards are world class already! I just wish there was more research in this area. Hopefully Max and his cohort will bring up the game by challenging academia. I will help any way I can. Might be time to bring you back to LSC. I agree that we need more research, but I would also contend that, while we are ultimately interested in the success of the underlying business models, the value of the program is in fact in changing the perspective and confidence of America’s great inventors/innovators. The Global Entrepreneurship Monitor – tracking levels of entrepreneurship in dozens of countries – has proven that the level of entrepreneurship impacts the level of economic growth. However, even in the best and most vibrant economies, no more than 10-12% of the adult population between the ages of 18 – 65 is actively engaging in entrepreneurial activity. Economist William Baumel argues that there are two fundamental factors that differentiate those who do engage in entrepreneurial activity from those who do not – perspective and confidence (self-efficacy). These ARE the antecedents to entrepreneurial behavior. In other words, the impact of our start ups on job creation will be measured by the degree to which the I-Corps graduates start companies that survive to create jobs. However, whether they start those companies or NOT will be determined by their perception of the opportunity and their confidence that they can succeed if they try. Bandura claims that 1/3 of the difference between those that take action in pursuit of opportunity can be explained by the degree of confidence they have that they will succeed. If I-Corps does NOTHING more than get 1/3 more inventors pursuing the market opportunities around their technologies because they think they can, the impact on our economy would be unprecedented. We would witness a true revolution and would see significant job creation even if the probability of success did not improve. I believe Steve has the program emphasis on the real issue, and we simply should be monitoring whether they follow through or not on their scalable business models and product market fit. Follow through % would be an interesting metric worth tracking for most incubators and very early stage programs such as StartupWeekend. I think less relevant for I-Corps as there is a more rigorous screening process to get into the program which is going to bias the follow through metric. You’d need a control group of people who would normally be accepted to I-Corp but are deliberately rejected and then tracked. One other thing you mentioned, I always hear about levels of entrepreneurship as directly correlated to economic growth, particularly from the mouths of politicians. I am not sure about this. Entrepreneurial activity is inversely correlated to economic growth. It’s highest in regions with high unemployment because those people can’t find a job…they have to go make one for themselves. Ergo, if we want to increase entrepreneurial activity, we should tank the economy. Obviously this is crazy, but I think it speaks to idea that we sometimes look for correlation when we should be looking for causation. I would be interested in seeing the % of GDP coming from companies created in last 5 years by industry sector. Awesome, exciting work Steve! So great to hear the deepest of the technicians love it as much as we do. Hi Steve, thanks for sharing this insightful experience. I have been focusing for a while now on the possibility to apply to lean launch pad to foster innovation in larger corporations. Can you provide any references on this topic? My co-author Bob Dorf has spent the last few years years working with some of the largest companies in the U.S. and abroad do just that. Drop us a line and we can continue the conversation. * It would be good if you could post more on how you deploy volunteers and what you expect of them. * I think it may motivate more people to volunteer. Thanks Steve, this sounds great. Where can i contact you? What we are trying to do is to take a few managers from some large companies along a journey with local startups and help them use what they learn in their corporate job. 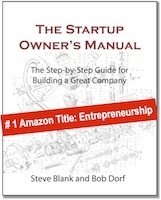 I recently bought a copy of your book “The Startup Owner’s Manual” and have been working my way through it. 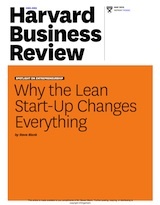 I would desperately love to attend your Lean Launchpad class. I’ll go wherever to attend it, do you have any coming up that I could come to? Hi Steve, waiting for your online lean launchpad class. any updates?also what graduate entrepreneurship program would you recommend. Thanks for your guidance. Great program! Be sure to focus on the requirements side of the project lifecycle to be sure the idea is clearly realized in the Lauchpad development stage. Here’s a quick article that explains why and how software requirements contribute to a truly successful project! We do a similar program here in the Netherlands by providing a program and coaching to students at levels and topics. Thus let them experience what entrepreneurship is all about with real tools, products, plans, sales etc. We call this learning by doing. Why not do some international exchange? Open to help!